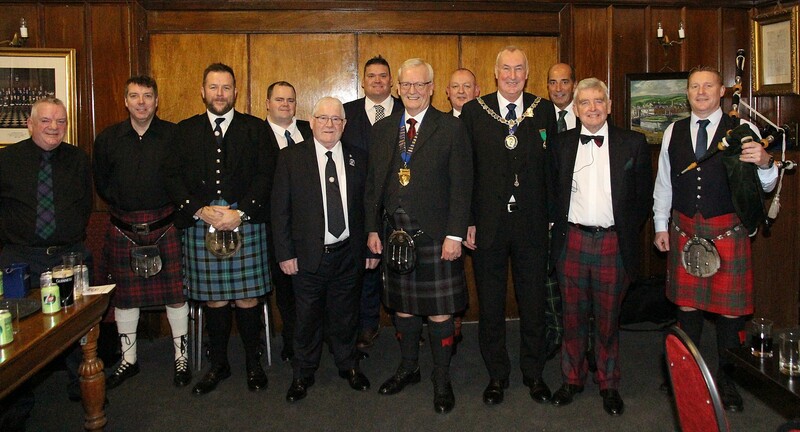 Another great attendance (142 members and guests) were assembled this year in the Alexandria Masonic for our annual supper, the attendance once again confirming the popularity of our event. 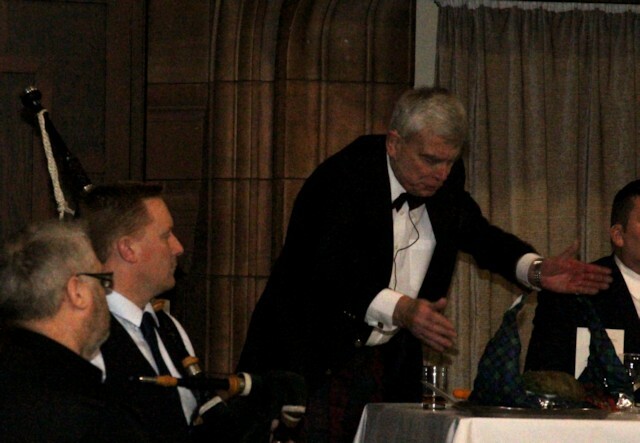 Following the retirement last year of Malcolm Gilmour, who was attending as an honorary member, the top table guests were piped in by our new piper, the excellent David Bruce. We hope to see David in this role for many years to come. 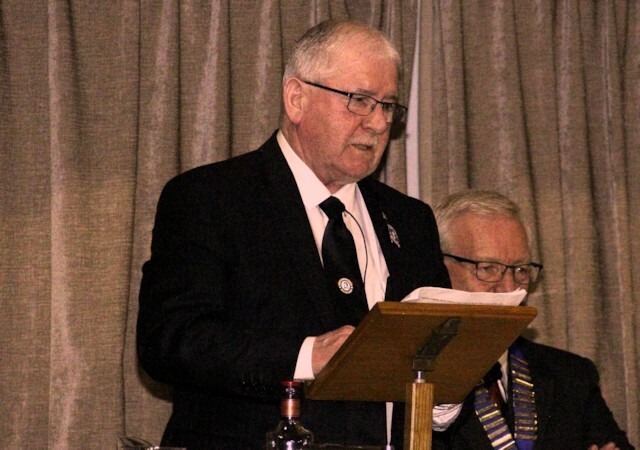 Chairman Ian Embelton welcomed everyone then the company observed a one minute silence for deceased member Hughie Smith and honorary member Lennie Moore. 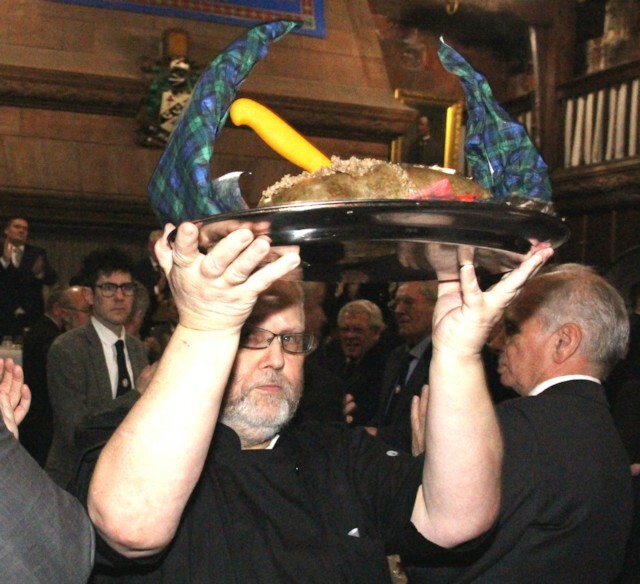 The haggis was once again delivered to the top table by Robert Mills of Venue Catering, accompanied by new piper David Bruce. 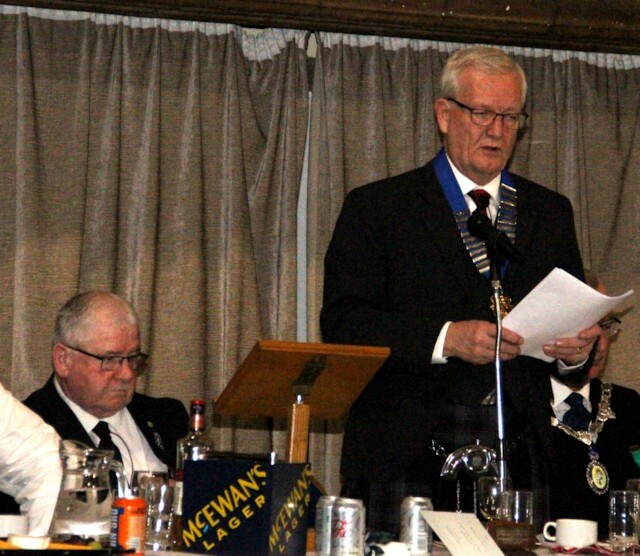 The chairman offered the Selkirk Grace after Dr. Tom Barlow had addressed the Haggis. 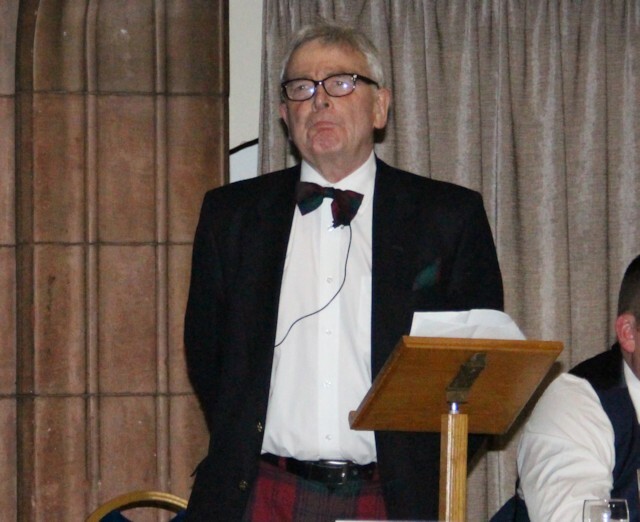 Tom is a keen Burnsian and a long standing member of both the Alexandria Burns club and Dumbarton Burns club. He has entertained us many times over many years. 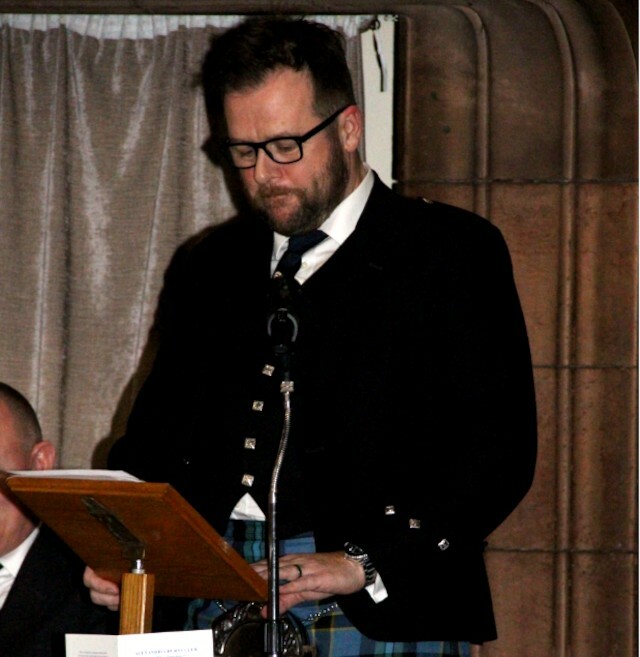 He followed up the Address to the haggis with his Address to the Unco Guid in the second half of the programme. The company then enjoyed another excellent meal from Robert Mills' team from Venu Catering before the Chairman, Ian Embelton proposed the Loyal Toast. 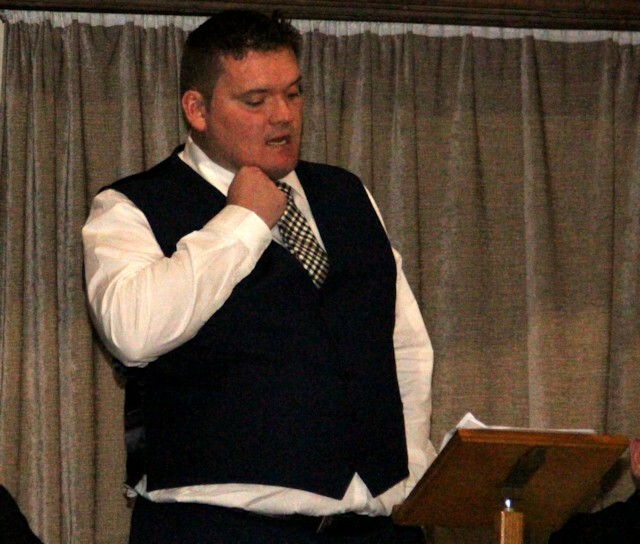 After enjoying the meal and the first interval of the evening the Immortal Memory was presented by our Vice President Walter Snedden. Walter is a real student of Burns and his knowledge of the bard was clearly visible in his excellent Immortal Memory. 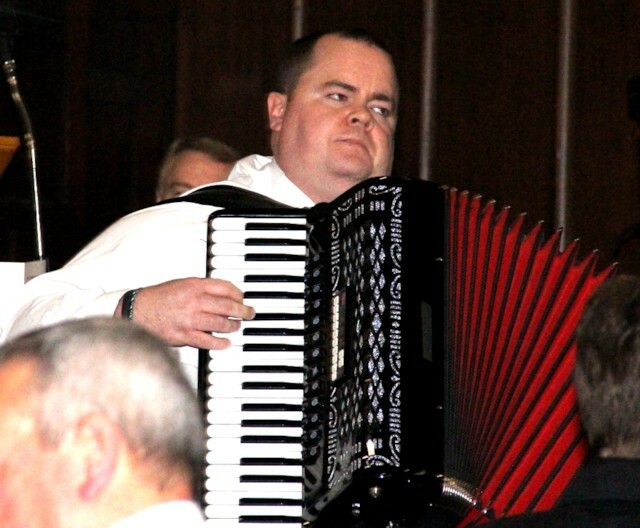 As at last year's supper, the first musical contribution was by Tommy Munley. 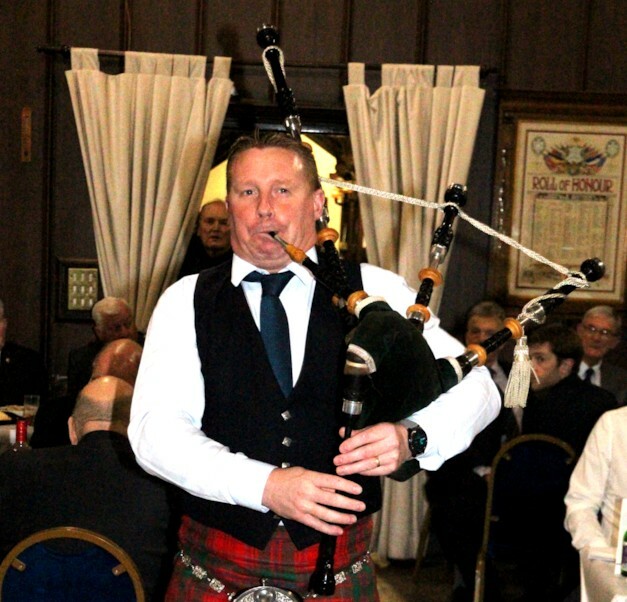 Tommy is an experienced local musician, who is now a member of the club. He performed for us last year for the first time and he will no doubt do so again many time as his arrangements of Burns' music are very popular with our members. 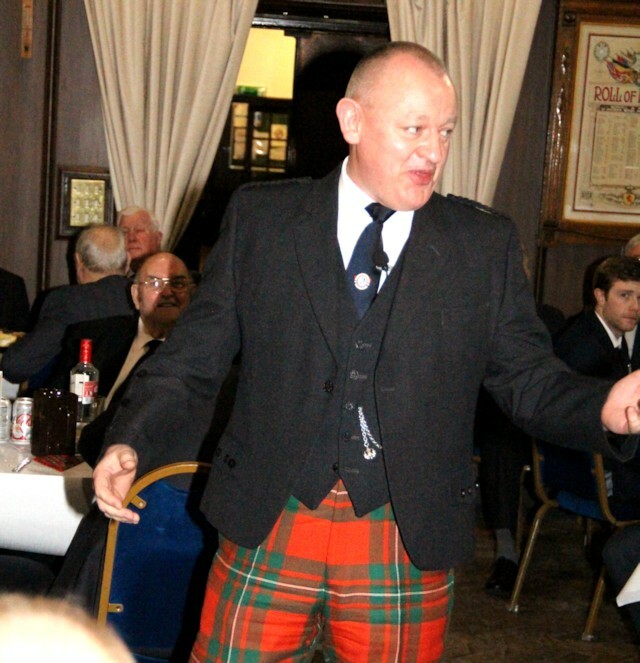 The toast to John Barleycorn was offered this year by the highly entertaining Blair Allan. Blair has spoken for us before at our St Andrew's night. He is also now a member of the club and the audience reaction suggests that we will see him back again in future. Blair's toast was very funny. Andrew Gordon has become a regular performer in recent years. Due to a misunderstanding Andrew did not appear last year and he was missed. 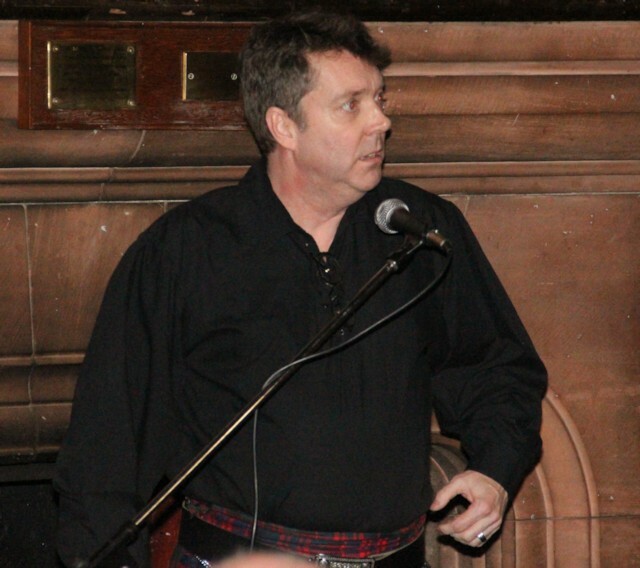 In his two slots during the evening he again enthralled the company with his interpretations of some of Burns' music. His version of A Red, Red Rose was simply breathtaking. Iain Rodger is originally from Clydebank. He spent many years living and working abroad before returning to Scotland three or four years ago. He now lives in Fenwick. He joined Alexandria Burns Club in 2017. Tonight Iain confidently performed Tam O'Shanter. His diction and delivery were perfect as witnessed by the audience reaction. No props required here - a great "Tam". We'll be seeing Iain again for sure. Next up was Frank Kelly with some clatter. Frank was standing in for his dad. Willie Kelly, who is currently not well. President Ian introduced Frank and sent the best wishes of the club to Willie. Frank is a committee member and a popular artist and musician. He entertained the company with some very funny stories delivered in his own unique way. He finished with a wonderfully powerful, unaccompanied version of Westlin Winds. Iain Gordon is a weel kent face in Burns circles. 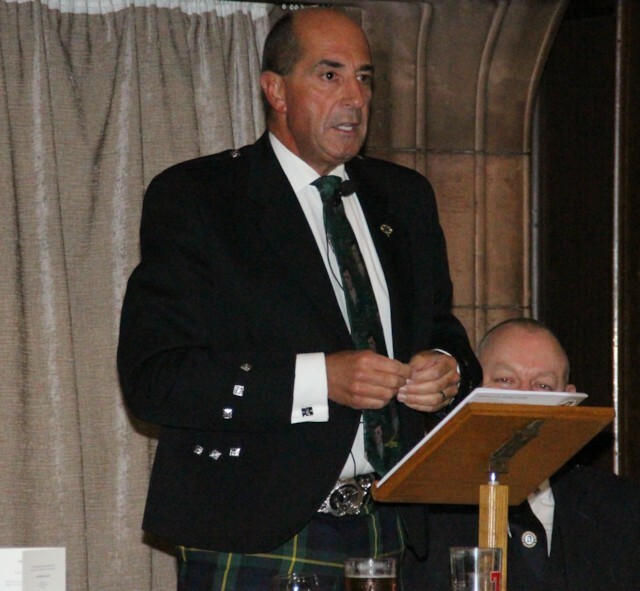 He is the secretary of the Bridgeton Burns Club and he speaks at many Burns and other after dinner events. 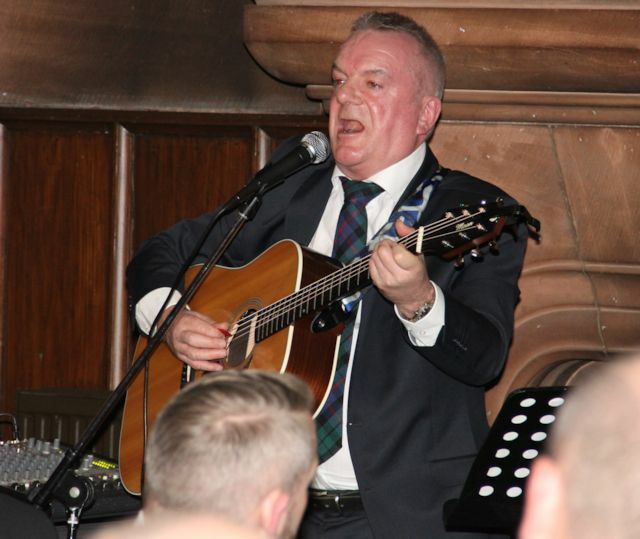 He toasted John Barleycorn here most entertainingly three years ago so I don't think I would be discrediting any of our other artist in saying that his Toast to The Lasses was possibly the most eagerly anticipated. He did not disappoint. His toast was very funny and professionally delivered. This was obvious by the company's reaction. We hope to see Iain again in the not too distant future. The evening drew to a close with Dr. Tom Barlow's reading, more music from Andy Gordon and his accordion before the final part of the programme, which was Gary Weir's Toast to the Artists. It's never easy doing a toast to the artists - "the graveyard shift" - but Gary provided an entertaining look back at the events and the artists for the evening along with some funny stories. This was demonstrated once again by the good order he enjoyed from our company after a long evening. Another very successful Burns supper concluded with the company singing the Star o' Rabbie Burns and finally Auld Lang Syne. Those of us who attend many Burns suppers are aware of the importance of good order while people are performing. An evening can be spoiled by the audience being less than attentive so we should give a special mention to the company on the evening. Once again they afforded the very best of order to our artists. The committee would like to thank all members and their guests for that. It is very much appreciated. Thanks also to everyone who assisted in planning and organising the event. The St Andrew's Night dinner this year will take place on Friday 29th November, in the Vale of Leven Bowling Club. Next year’s supper will take place in the Alexandria Masonic Temple on the bard's birthday, Saturday 25th January 2020.